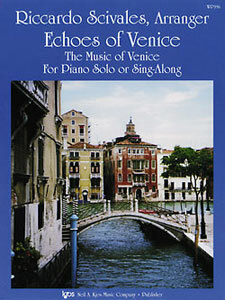 Echoes of Venice is available through music dealers and online at the Kjos Music website. I am using this book with many of my piano students since several years and with great success at schools recitals too. This collection of easy intermediate piano arrangements (with lyrics included) is dedicated to the beautiful city of Venezia and features six famous classical and traditional pieces closely related to it: Il Carnevale di Venezia (Paganini), Largo from “L’inverno” (Vivaldi), Barcarola (Offenbach), La biondina in gondoleta (Mayr), and the old traditional songs Il barcarol del Brenta and E mi me ne so ‘ndao (this latter also known as Peregrinazioni lagunarie or Tragando l’ansana). Prog Suite Animali Fantastici dei Quanah Parker!